When you have a sore throat, your first inclination is to rush to the doctor for antibiotics. But unless Strep bacteria causes a sore throat, antibiotics can do more harm than good. One of the best remedies for a sore throat is essential oils, but many people don’t know how to use them. 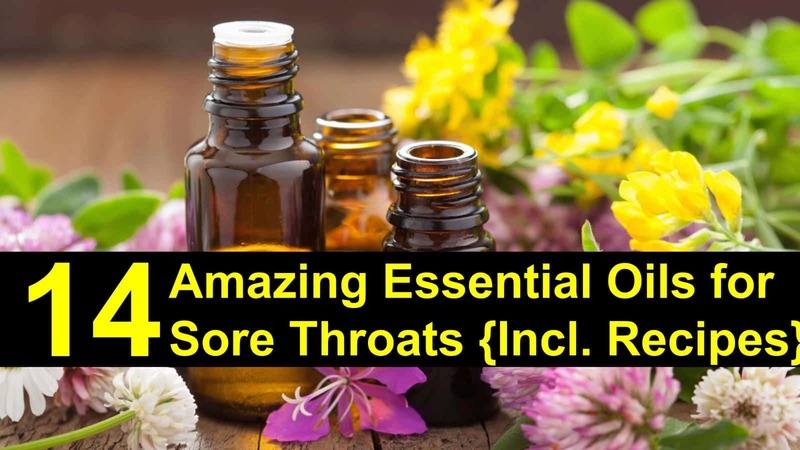 I’ve put together this article to help you find the best essential oils for sore throats, essential oils for strep throat, essential oils for cold and cough, and to guide you in how to use them. By using essential oils for your sore throat, you boost your immune system, kill viruses and bacteria, prevent the spread of illness to other family members. Essential oils relieve the pain and inflammation caused by the infection and put you on the path to good health, which is why essential oils work. While in a very succesful post here on tipsbulletin, we focused on how to get rid of a sore throat, this a article is specifically about what essential oils to best use for sore throat. These essential oils are good for a sore throat from any cause. They are effective against both viruses and bacteria, and they help relieve other symptoms that accompany a sore throat. This list also includes essential oils for cold and cough. 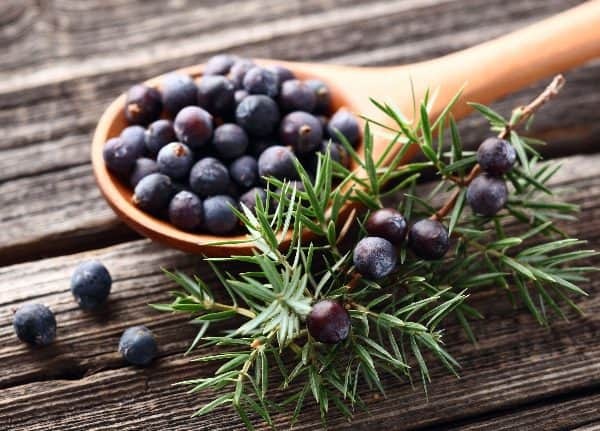 Juniper berry essential oil is a natural remedy for sore throats and respiratory infections, as it contains antioxidants, antibacterials, and antifungals that fight infection. Inhale juniper berry through aroma therapy methods, apply diluted juniper berry oil directly to the skin, or take high-quality oil by mouth. Always use juniper berry in low concentrations. Do not take it if you are pregnant, trying to get pregnant or if you have kidney problems. 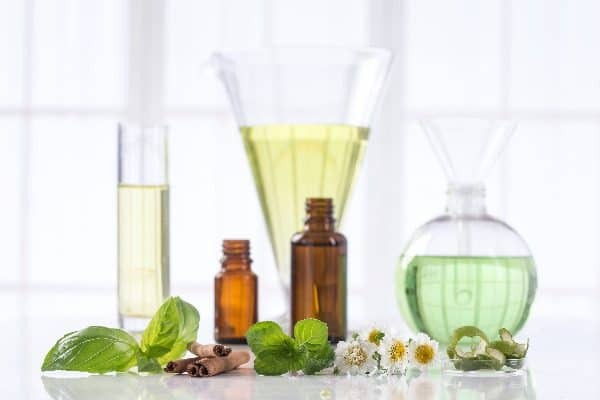 Peppermint oil is helpful for the treatment of sore throats, sinus infections, cold sores, respiratory infections and inflammations of the throat. Menthol, an active ingredient in peppermint oil, cools and soothes the throat, calms inflammation and breaks up mucus. Peppermint oil also has antioxidants, antimicrobial effects, and decongestant properties that help heal your throat. Preliminary research indicates that peppermint essential oil is effective in calming a sore throat. While further research is still needed, peppermint oil appears to be a beneficial addition to your sore throat tea or another remedy. Thyme is a culinary herb with medicinal properties as well. It contains helpful chemicals that help relieve bacterial infections and throat irritations. It can also soothe muscle spasms such as coughing. For best results, use in combination with other essential oils. Thyme oil, diluted with a carrier oil, can be taken by mouth, applied to the skin of the neck and chest for hoarseness, laryngitis, swollen tonsils, sore throat, and coughing, or inhaled through aromatherapy. Thyme oil kills germs and is an ingredient in mouthwashes for sore throats. Some research suggests that thyme oil, in combination with other herbal supplements improves bronchitis, coughing, and the mucus production that causes a sore throat in patients with these symptoms. It reduces coughing associated with bronchitis, the common cold, and upper respiratory tract infections. For more information on how to use thyme oil for sore throats, coughs, and colds, see the recipes and information below. Lemon oil comes from the skin of the lemon and has antibacterial properties. It is also high in vitamin C and anti-inflammatory. It soothes the throat by keeping it moist by causing an increase in saliva and kills surface bacteria. Lemon essential oil is an excellent oil for aromatherapy, as a gargle ingredient, and for an addition to tea. Sage has antiseptic, antibacterial and astringent qualities that allow it to be beneficial for sore throats and coughs. Use sage oil in a diffuser for aromatherapy, as a gargle, or in a throat spray. Also, see our recipe for sage tea below. Avoid sage oil if pregnant or breastfeeding. Eucalyptus is an antimicrobial agent that acts to prevent the spread of infection in the upper respiratory tract. It also relieves pain and stimulates the immune response. Eucalyptus works to break up mucus and phlegm and reduce congestion. It is useful for colds, flu, allergies and other causes of a sore throat. Avoid using eucalyptus oil if you are pregnant or breastfeeding, and do not use it on a child under two years old. Oil of Oregano is a smart choice for a sore throat from any cause. It is useful against both viruses and bacteria and also has antifungal properties. It has been shown to be effective against antibiotic resistant bacteria such as MRSA. Mix 1-2 drops of oregano oil in a teaspoon of carrier oil and take by mouth. It will burn a little, but the burn quickly dissipates. Take oregano oil with food 2-3 times daily for 5 to 7 days. 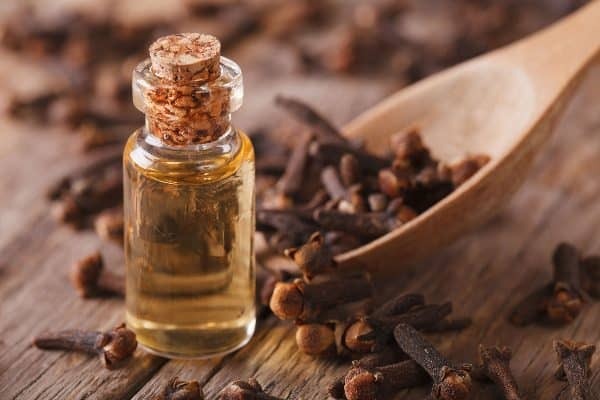 Clove oil has analgesic properties. It numbs the area of contact and relieves pain quickly. But it is strong, so a very little goes a long way. In addition to its analgesic properties, it is an antiseptic, antibacterial, antifungal, and antiviral. It is a powerful antioxidant with an ORAC value of 10,786,875 µ TE/100 GMS. It is also an anti-inflammatory and an immune stimulant. Clove oil can be an irritant when used at full strength, so always dilute it with a carrier oil before use. Clove also affects the uterus and should not be used by women who are pregnant or trying to become pregnant. Hyssop is an ancient herb, used to treat infections, including the plague. It exhibits antibacterial and antifungal activity against common pathogens. It has strong antiviral properties, and since a virus causes most sore throats, hyssop should be one of your go-to treatments for a sore throat. Pinene and monoterpene, found in hyssop oil, act as decongestants to loosen mucus and treat diseases of the respiratory system. If respiratory symptoms accompany your sore throat, place two drops of hyssop oil in your vaporizer or diffuser and breathe in the vapors. Like all essential oils, use Hyssop oil in moderation with the guidance of an experienced aromatherapy expert or a natural holistic practitioner. People have used frankincense throughout history for its health benefits. Its effectiveness in healing a sore throat is due to its antiseptic, disinfectant, and astringent properties. It acts as a general tonic, boosting the immune system and improving the general health of the body. It is also soothing for coughs and loosens phlegm in the respiratory tract. Frankincense essential oil is effective against bronchitis, nasal congestion, sore throat, and laryngitis. Its anti-inflammatory properties calm inflammation, open breathing passages, and helps relieve pain. Place 2 to 3 drops of frankincense in a diffuser or vaporizer. Inhale the vapors to open breathing passages and calm a sore throat. Thieves oil is a mixture of essential oils that complement each other and boost their healing effects. The formula includes clove oil, lemon oil, cinnamon oil, eucalyptus oil, and rosemary oil. The blend has antiseptic, antibiotic, and antiviral properties. The combination of essential oils in Thieves oil supports the immune system and supports healthy lung and sinus function. It also relieves pain, reduces inflammation, and treats the underlying virus or bacterial infection causing the sore throat. Diffuse Thieves oil in a diffuser or vaporizer three times a day. Inhaling the essential oils will help your sore throat and prevent it from spreading to other family members. Basil essential oil has anti-inflammatory and antibacterial properties, and it’s a powerful adaptogen that helps the body fight disease. Use it to decrease inflammation in sore throats and sinus tracts. It works to remove viruses and bacteria from the body and prevent their growth. Add a drop of basil oil to soup or salad dressing. Dilute basil oil with an equal amount of coconut oil and apply topically to your chest, neck, and temples. Coconut oil is an ideal carrier oil for your essential oil remedy because it has healing properties of its own. It contains antioxidants that stimulate tissue repair. Coconut oil works with your essential oil to speed recovery, decrease inflammation, and relieve pain. >> Related: Coconut Oil vs MCT Oil – Which is better? Many of the essential oils you’d use to treat a sore throat double as fantastic treatments for cold and cough, too. Lemon, for example, contains many antibacterial and anti-inflammatory properties, making lemon juice an excellent addition to essential oils for cold and cough. Frankincense is one of the best oils around for clearing your lungs and sinuses and regulating your breathing patterns. In its vaporized form, frankincense can go a long way toward clearing phlegm from your lungs. If you’re familiar with cough syrups, you’ve probably noticed that many of them contain peppermint. Manufacturers include peppermint because it not only tastes good, but it’s an effective cough suppressant. Peppermint has antispasmodic properties, meaning that peppermint can relieve the involuntary spasms of muscles (which is what happens when you cough). Add peppermint to your collection of essential oils for cold and cough. Finally, eucalyptus oil can reduce inflammation in the respiratory system and loosen phlegm, on top of improving circulation in the respiratory system as well as stimulate the immune system (which will help you recover from the illness quicker). Most sore throats are viral and accompany symptoms such as a runny nose, cough, and congestion, but little or no fever. Sore throats accompanied by a fever of 101 or higher for more than three days is usually strep throat, which is a bacterial infection. Antibiotics will not help sore throats caused by a virus, and overuse of antibiotics may strengthen bacteria and allow them to become antibiotic resistant. Unless you have a fever of 101 or higher, use natural treatments to soothe your sore throat. Aromatherapy is especially useful for treating and preventing the colds, flu, and sore throats associated with respiratory infections. Essential oils are very strong and best used diluted. Some oils are diluted 1:1, while others are diluted much more, possibly one to two drops of oil in a tablespoon or more of carrier oil. Use almond oil, coconut oil, avocado oil, jojoba oil, or olive oil as a carrier oil. The combined oils can be applied topically to the affected areas. Gargling is an effective way to deliver the essential oil directly to the back of the throat. Stand at the sink with a glass of your gargling solution. Open your mouth and take a deep breath. Close your throat and take a mouthful of the solution. Tilt your head back and gently push air out through the solution. Repeat the process until the solution is used up. Gargle three to four times a day until your throat heals. An essential oil is the concentrated oil or extracts from a plant. They are the “essence of” the plant and contain the concentrated beneficial chemicals of the plant. High-quality essential oils are usually extracted by distillation or by the use of steam. Occasionally, manufacturers will press oils. Essential oils can also be extracted using solvents. Be careful with solvent extracted oils, as solvent residues can be present and unhealthy. When used according to directions, essential oils are considered safe. There is always a chance that a person could have an allergic reaction to an essential oil, so go slowly. Pregnant and breastfeeding women should be careful when using essential oils. Pregnant or lactating women should never use some essential oils. Do not use essential oils for infants and young children without the guidance of a professional. When taking essential oils internally, take one to two drops daily for two to four weeks, then take a two-week break before repeating the treatment. Mix one to three drops of essential oil into a tablespoon of carrier oil. For internal use: Mix one drop of essential oil into a cup of tea, juice or water, and drink. For topical use: Mix one drop of essential oil into your favorite lotion. Mix the coconut oil and beeswax in a small mason jar. Put one to two inches of water in a saucepan over low heat. Place the jar in the water. Add the eucalyptus oil and peppermint oil. Stir to combine. Pour the mixture into metal or glass containers. Allow the mixture to cool and set. Use as a rub on neck and chest to relieve a sore throat, cough, and congestion. This essential oil cough syrup boosts the immune system as it soothes your sore throat. Mix honey, lemon essential oil, lavender essential oil, peppermint essential oil, and frankincense essential oil. The honey will help soothe your throat, while the oils fight the bacteria and inflammation, and help your throat heal. Combining these ingredients will make one dose. Take the cough syrup two to three times daily until your sore throat heals. The immune-system-boosting qualities of the recipe make it great for a sore throat on its own, or you can use it if you have the flu for a general remedy. This gargle recipe is designed to inhibit the growth of bacteria, break up and remove mucus, and dry out the throat. Use it when a sore throat accompanies postnasal drip or a productive cough. Reduce heat and simmer until salt dissolves. Allow to cool, then add the Cayenne oil. The recommended amount is one drop, but you’ll want to use more or less depending on your tolerance. Add the peppermint essential oil, orange or lemon essential oil, thyme essential oil, and myrrh essential oil. Gargle with 1 cup of the mixture. Rinse out your mouth, then repeat with remaining cup of gargle solution. Mix 1 teaspoon salt in 1 cup hot water. I hope that you enjoyed the article and that you learned more about using essential oils to treat a sore throat. It is important to have these oils handy when illness strikes. They will soothe your throat and help you recover quickly. 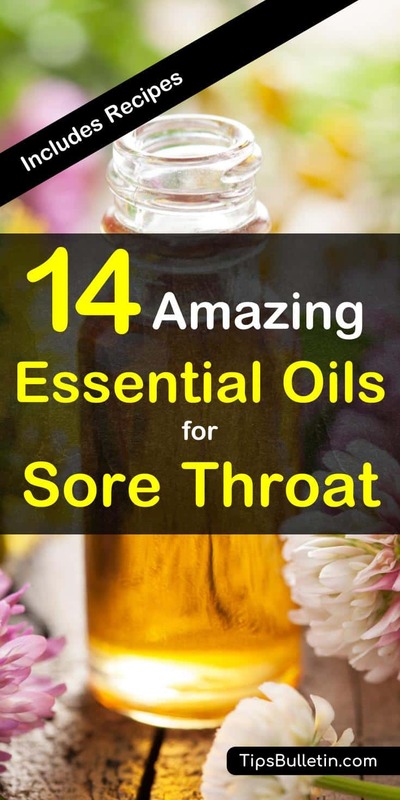 In this article, you learned about essential oils for sore throats, essential oils for strep throat, and essential oils for cold and cough. There are many other essential oils for medicinal purposes. Please feel free to add your favorites in the comment section and to share this article to Facebook, Pinterest, and Twitter so others can benefit. I hope that you try some of these remedies the next time a sore throat strikes. Let us know how they work for you.